The Christmas Train is the story of Anna and Eva. Anna is a sweet little 10-year-old girl who lives with Nana Rose, her grandmother. After the inevitably sad death of Nana Rose, her mother decides she can’t take care of Anna and sends her to live with her dad in Iowa; a man Anna has never met. 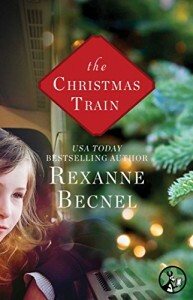 It is on her journey on “the Christmas train” that Anna meets Miss Eva, an older woman who thinks she’s on a train to her villa in Germany in pre-World War II. Having had such a close relationship with her grandmother, Anna sees a little of her grandmother in Miss Eva and so we follow them as their lives become intertwined in a friendship that will melt your heart and give you all the feels. This is a feel good story, with lovable characters and a warm positive message. It’s impossible not to fall for Anna. She’s this adorable 10 year old that thinks and behaves like a grown up. Miss Eva, even though she’s the grown up that acts like a lost 10 year old, you can’t not fall for her in her time of need. As a family member of someone who is struggling with senile dementia, it was impossible not to feel compassion for Miss Eva. My favorite character is Nana Rose. You gotta love Nana Rose! Find out what I loved about her in the full review on my blog. If you’re looking for a short and cozy Christmas story to read curled up in a blanket with a cup of hot cocoa with marshmallows and candy canes, this is the book for you. If you are traveling during this Christmas season and you need reading material, this is the book for you and your journey. It will warm your heart, make your trip more cozy but most importantly it will make you want to be aware of the people travelling with you. Who knows, maybe you will meet your “Anna” or your “Miss Eva” on your Christmas bus, plane or train. If you do, you will be blessed.